Fourth Wall Entertainment Troupe provides interactive theatrical experiences by producing quality entertainment through drama, dance, music, comedy and culture. We endeavor to support our community and enlighten audiences with whimsical live theatre. Grab your best guy or girl and hustle on down to The Metropolitan for a very special Valentine’s dinner and dance. 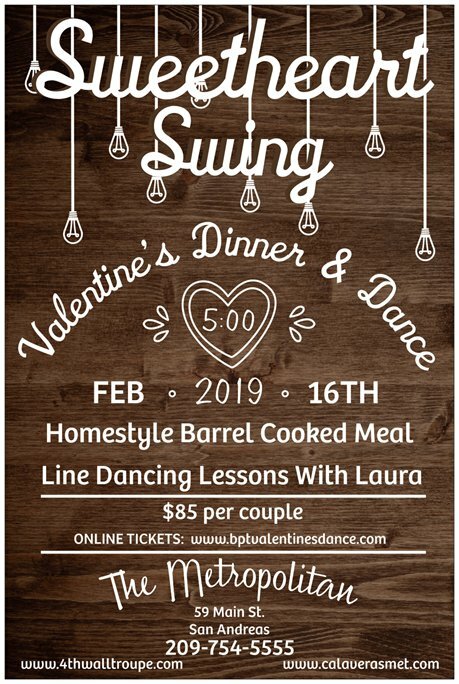 After you enjoy your down home country style meal, you’ll hit the dance floor for Line Dancing Lessons with Laura! Great fun for couples!